Arriving by cruise ship in Tromsø? We offer individually designed nature sightseeing tours in English and German which are aligned to the time the ship is in port. Bigger cruise ships (such as Aida Luna, Mein Schiff, Costa, MSC) normally moor in Breivika, which is about 4 km north of the city centre of Tromsø. 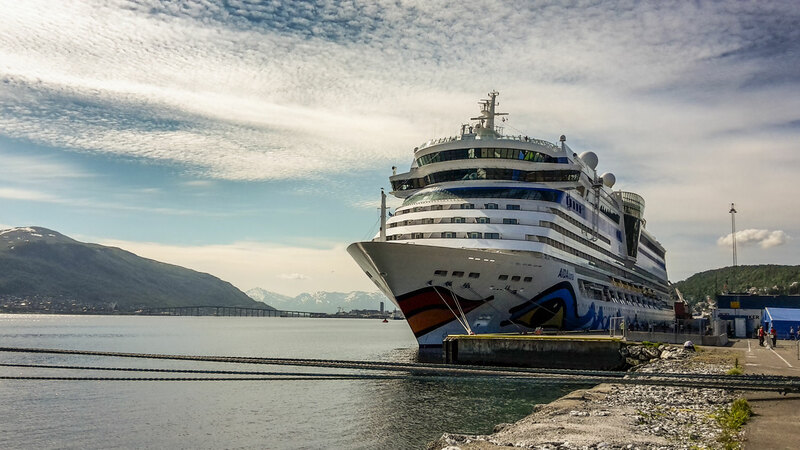 Smaller ships, as for example Aida Cara or MS Europa, moor close to the centre at the port called Prostneset. Our tours start and end at the respective port. You don't need to bother about transportation! Our "All Day Fjordtour" to Sommarøy in a small van (max 16 persons) usually fits into the time frame. Please write us an e-mail so we can coordinate departure times accordingly. You can pay for the tour on the very day with either credit card or cash (NOK). In the unlikely event that a ship can't land in Tromsø there will be a full refund if you already paid in advance. Tromsø Individuell is registered in the Norwegian government agency Brønnøysundregistrene (Brønnøysund Register Centre) with the number 996597563. Our tours are also promoted via the local Tourist Information Centre "Visit Tromsø". You'll find some reviews here on Tripadvisor. Do you have any questions left? Have a look at our FAQ or write an e-mail. We are looking forward to seeing you in Tromsø!